Structures of NaCl and LiCl aqueous solutions in pores of carbon nanotubes with diameter 1 and 2 nm were evaluated by using X-ray diffraction and molecular dynamics simulations. 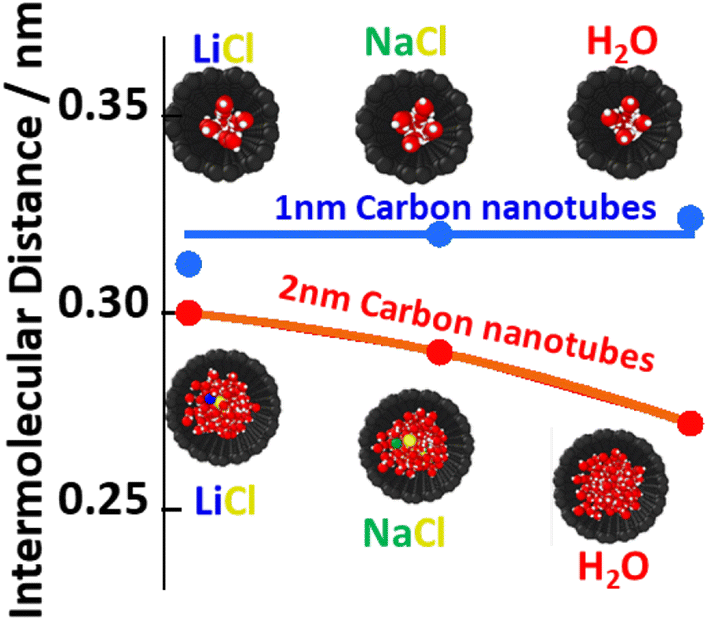 Water intermolecular distances in carbon nanotubes with 1 and 2 nm pore diameters were more elongated and shortened than bulk water, respectively. Those were results of weakened and strengthened hydrogen bonds. The structures of aqueous solutions in carbon nanotubes were considerably different from water despite tiny amounts of ions in the pores. 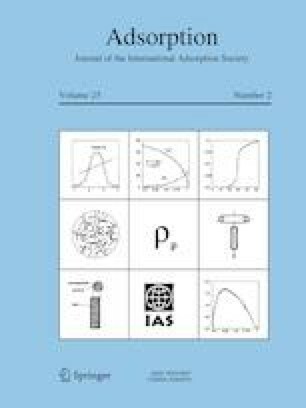 The nearest neighbour distances in aqueous solutions were rarely changed from that in water system in 1 nm carbon nanotubes pore, while those were longer than water in 2 nm carbon nanotubes pore. On the other hand, the second nearest neighbour distances in aqueous solutions in 1 and 2 nm pore diameter carbon nanotubes were both decreased from those in water in carbon nanotubes. Significant hydration formation and cleavage of hydrogen bonds were thus observed in 2 nm carbon nanotubes pore, because the elongated nearest neighbour and shortened second nearest neighbour distances were observed. Anomalous feature of the unchanged nearest neighbour and shortened second neighbour distances in 1 nm carbon nanotubes pore is the result that water intermolecular distance was much longer than bulk and hydrogen bonds were thus severely separated. Ions might play dominant role to connect hydrogen bonds and of course form hydration shell. Those anomalous structure changes from water to aqueous solution were observed only in extremely narrow carbon nanotubes. The online version of this article ( https://doi.org/10.1007/s10450-019-00082-w) contains supplementary material, which is available to authorized users. The XRD data at SPring-8 were corrected with help from Dr. S. Kawaguchi. The authors thank the Supercomputer Center, the Institute for Solid State Physics, the University of Tokyo for the use of the facilities. This research was supported by Sumitomo Foundation, and Shimadzu Foundation.